Spidermetrix is a one of the leading paid online survey website started on 2000, Australia. Spidermetrix provides online job by paying for each completed survey. Unlike most of the survey websites they pay cash and also you can redeem your points to vouchers. They offer surveys in the fields like IT, Marketing, Business, marketing, advertising etc……… So it will be best for online job seekers. Students, house wives can fill their purse with extra cash by working in spare time. Any one who is 14 years old or above can join spidermetrix. Anybody with English and basic browsing knowledge. You can work from anywhere (Home, internet cafe, office…). Unlike PTC jobs which can be accessed from only static IP. Enter the valid e-mail address, date of birth and gender. Fill the zip-code, your nationality. Tell them how do you know them in the drop down box. Enter the spider name which is your user name. If you wish you can subscribe to their news letter. If you register with your e-mail ID more than one time your rewards may reset. 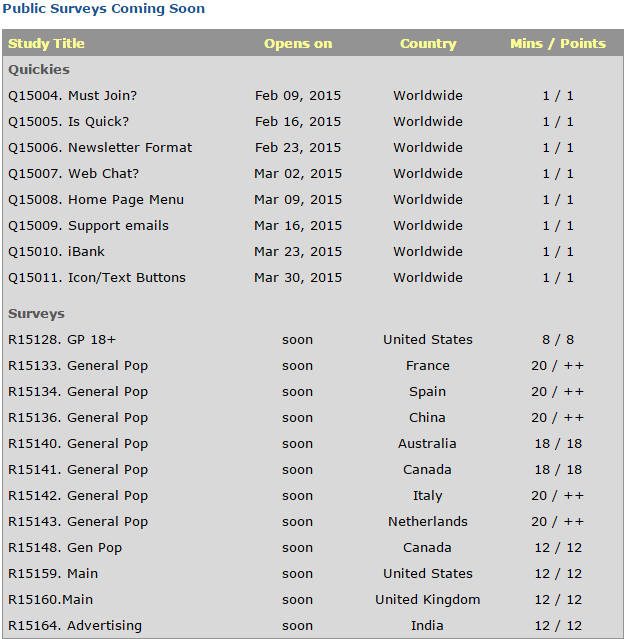 Click on Surveys > now open to see the available survey jobs in your country as shown below. You can see the job listed with the status and rewards of each survey. TNA – Temporarily not available. Each completed survey will be awarded with points which can be redeemed into cash or rewards. For example a survey has been clicked. A new page with the survey question will be opened. It will be the choosing type question. So choose the relevant answer and click continue for next question. Be true to answer the questions, so that you get relevant surveys in future. After the survey has completed you will get your balance and reward information as shown below. This particular survey paid me 8 points. Survey length will depend on the type and the reward. It can range form 1-25 minutes. So the more time the survey is the more you will be paid if you complete. 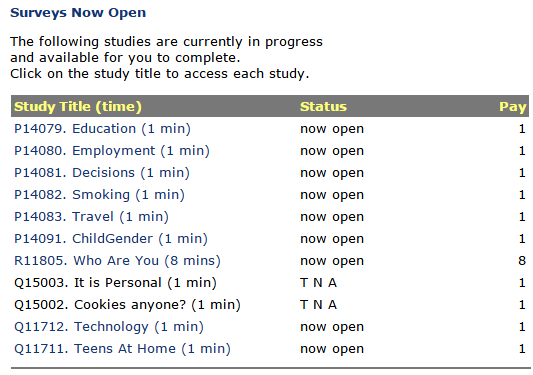 By clicking coming under the survey menu you can see the fore coming surveys as shown below. 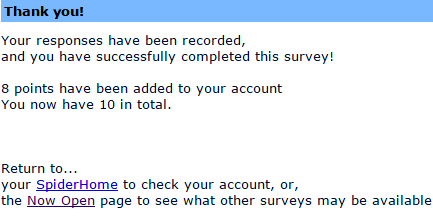 If the survey has ++ then you will be paid more than 20 points if you complete it successfully. By completing your main profile you can earn up to 15 points. You can also earn by referring your friends. Even you will be paid for each completed surveys by your referrals. A point is about 17 cents of an Australian dollar or 13 cents of USD. It might vary any time and you can check here. Spidermetrix offers points for each completed surveys which can be redeemed as cash rewards via Paypal or vouchers(Amazon.com). You can also donate to world vision Australia. Spidermerix offers three types of surveys the quikie which takes about 1 mins to complete and offers 1 point, the trial offers 2 points and the main surveys which lasts about 15-20 mins and offers above 20 points. Minimum payout 300 points = $50. Unlike global test market the points you have earned does not expire. 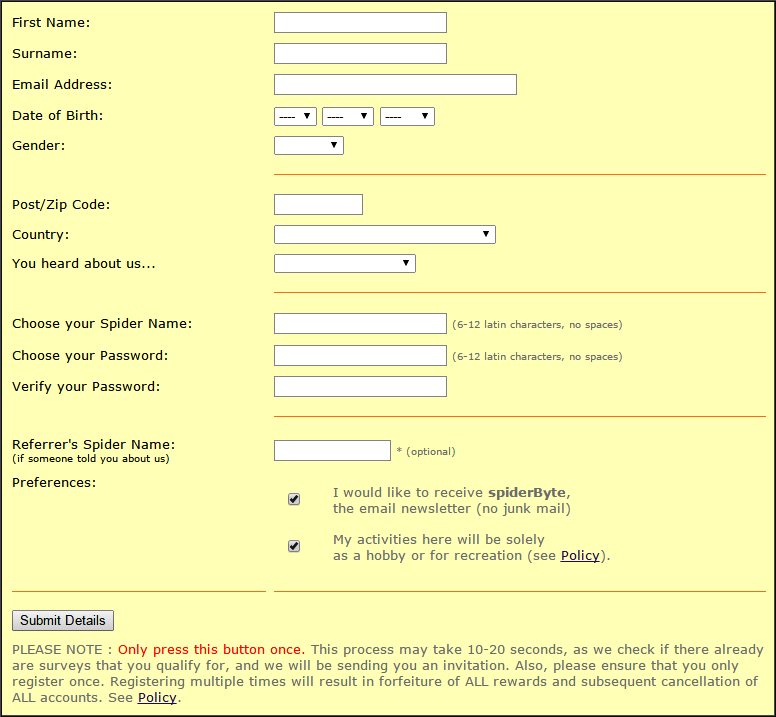 Tags: Spidermetrix an paid online survey site, how to earn money from paid online surveys(Spidermetrix).